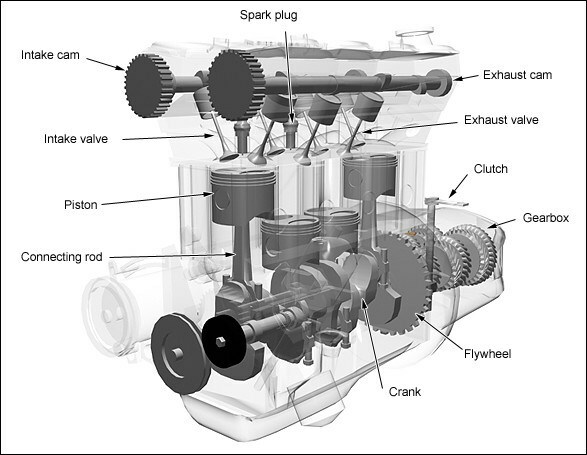 These are the most basic engines used in cars & bikes i.e Four stroke cycle petrol engine OR 4 stroke engine(often called). It is very easy to understand until & unless you wanna do all the thermodynamic calculations & all that stuff ! The name itself gives us an idea – it is an Internal Combustion Engine where the piston completes 4 strokes while turning the crankshaft twice. A stroke refers to the piston travelling full in either of the direction. 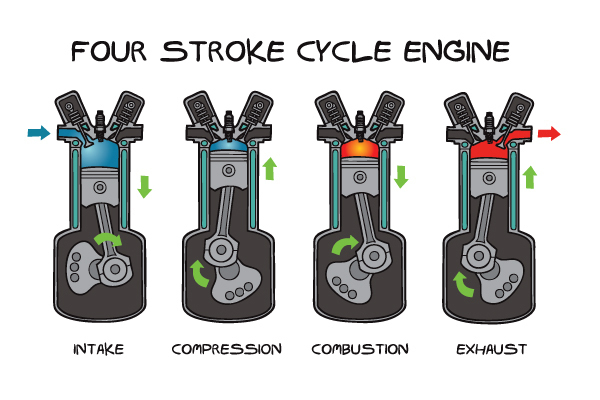 A cycle gets completed when all the 4 strokes get completed. The four stroke engine was first demonstrated by Nikolaus Otto in 1876, hence it is also known as the Otto cycle. Piston – In an engine, piston is used to transfer the expanding force of gases to mechanical rotation of crankshaft via a connecting rod. The piston is able to do this because it is secured tightly within cylinder using piston rings to minimize the clearance between cylinder and piston ! Crankshaft – A crankshaft is a part which is able to convert the reciprocating motion to rotational motion. Connecting rod – A connecting rod transfers motion from a piston to crankshaft which acts as a lever arm. Flywheel – Flywheel is a rotating mechanical device which is used to store energy. Inlet & Outlet valves – It allows to enter fresh air with fuel & to exit the spent air-fuel mixture from the cylinder. Spark Plug – A spark plug delivers electric current to the combustion chamber which ignites the air-fuel mixture leading to abrupt expansion of gas. In this stroke, the piston moves from TDC to BDC [(Top Dead Centre – the farthest position of piston to the crankshaft) to (Bottom Dead Centre – the nearest position of piston to the crankshaft)]. The piston moves downward sucking the air-fuel mixture from the intake valve. Here, the piston moves from BDC to TDC compressing the air-fuel mixture. The momentum of flywheel helps the piston to move upwards. The second rotation of crankshaft has begun as it completes one full rotation during compression stroke. Power stroke begins with the expansion of air-fuel mixture ignited with the help of spark plug. Here, the piston moves from TDC to BDC. This stroke produces mechanical work to rotate the crankshaft. Again the momentum of flywheel moves the piston up from BDC to TDC thereby driving the exhaust gases outside through the exhaust valve. Suggested article – How do 2 stroke engines work ? How do inlet & outlet valves open & close at that particular times of strokes ? Well, they are not timed with a help of timer or clock (humour me). The answer is so amazing & solution is damn easy – Camshaft ! The camshaft is connected to crankshaft via a gear mechanism or meshed with the help of timing chain. A rotating cam on a camshaft ! Again, it proves that sometimes all we need is simple design. 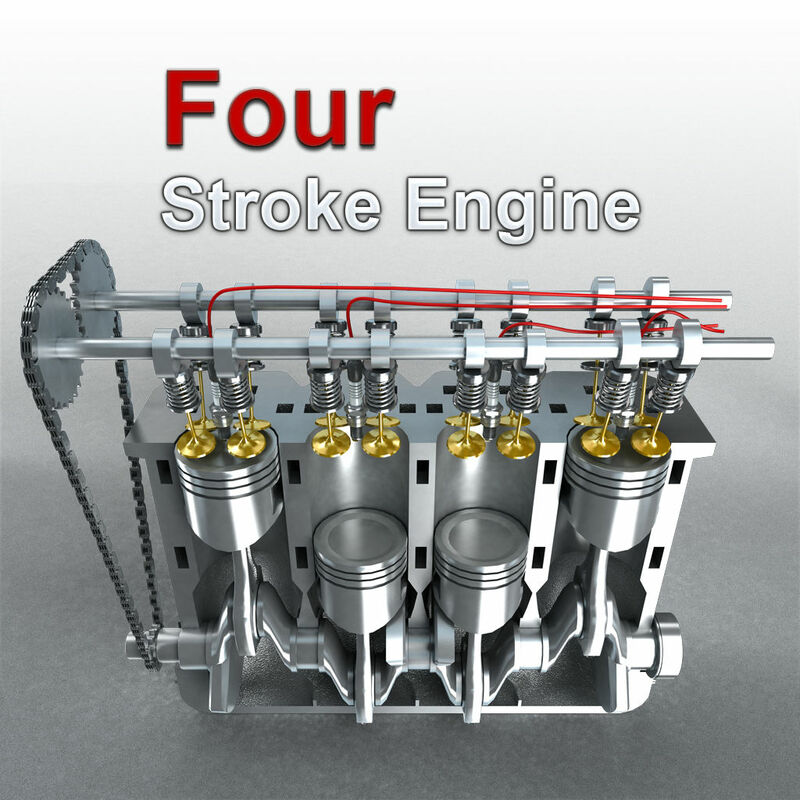 You might like – Differences, Advantages & Disadvantages of 4 stroke & 2 stroke engine ! Spark plug is only used in petrol engines & so used here. Diesel engines don’t have spark plug. The mixture is so highly compressed that it is able to ignite itself. How does the engine start OR when you start the engine how does the piston come down ? The answer is when you insert your key into your car to turn “on”, the battery turns a small motor which is meshed with the larger gear of the flywheel. Thus the engine starts by sucking air-fuel mixture into it & then follows the above cycle. Here is the video how engines start ? hey there… Well the firing order depends on type of arrangement; whether the cylinders are arranged in a straight line or 2 on right & 2 on the left side (like we call it “V” construction type engine). The design of crankshaft also matters here. The explanation is really good.The video made me to understand even better.